Denise (left) and her colleague (right) at the top of Mt. Kilimanjaro holding the BASF placard. Thank you for your email. I am out of the office Wednesday August 15 through Friday August 31 climbing Mt. Kilimanjaro in Tanzania to support and benefit the Leukemia & Lymphoma Society. Emails responses will be delayed. Yael immediately forwarded the message to our team to not only celebrate Denise and her incredible feat, but to bring attention to her honest OOO message, something we not only preach, but practice at AWE. 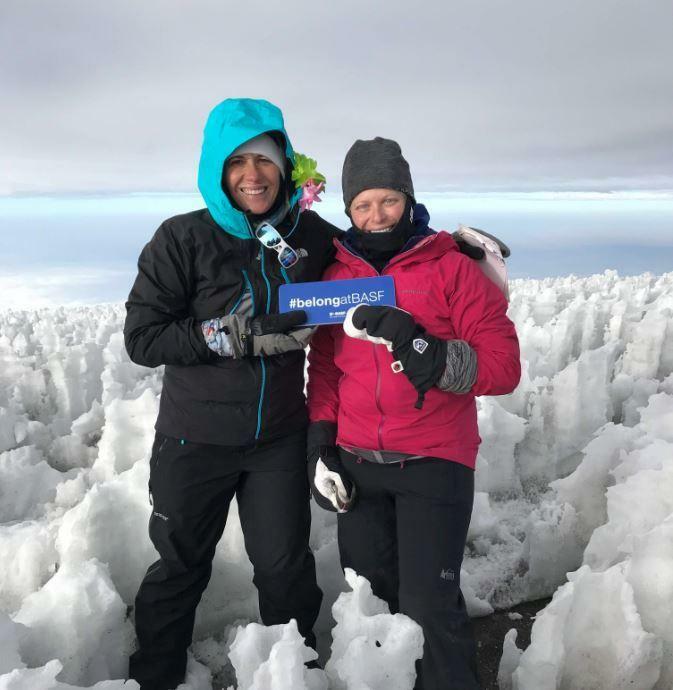 It’s not everyday that you meet a senior executive who has a thriving family and career and who is brave enough to step away from work for 2 weeks to climb one of the world’s highest peaks. I decided to call Denise and ask a few questions about her experience. What was meant to be a 30 minute interview turned into over an hour long conversation about family, loss, leadership, simplifying, perseverance, and doing what you set out to do. We caught wind of your climb because of your OOO message. I heard that you got a major and unexpected response from it. Can you tell me more about that and also about where you got the idea for an honest OOO? My inbox nearly doubled from this message! Almost everyone that sent me a legitimate email, got the vacation response and immediately sent a follow up email to send words of encouragement, curiosity, and support. I have to thank AWE and Meiko for challenging AWE Leaders in a recent email to be more honest with our OOO messages - I really took her challenge to heart and was very specific about what I was going to be doing and why. What did it mean to you to get responses from people that you work with in support of and interested in what you were doing? Did this enhance any of your work relationships? It did a couple of things. First, it connected me with people at BASF who I had never even talked to before. A lot of people responded and wanted to understand my motivation. Second, when BASF caught wind, they asked me and a colleague who were both doing the climb to carry these placards that had BASF’s # for a new campaign. We carried those placs all the way to the summit and took a picture. Corporate HQ ended up sharing that photo on BASF’s socials and made us their #WCW! Individuals from my team commented on the photo saying things like “my boss is a badass!” and that made me feel really good. It feels great to know that people are proud to work with you. Did this positive response to taking time off change the way you think about vacation? I have always been a big believer of time off and I take as many vacations a year as I possibly can. I really love this piece from the Netflix culture deck, “We encourage our leaders to take big trips and come back with big ideas.” I certainly have bigger thoughts after coming back from a trip and this last one is no exception. I heard that you shared the “honest OOO” with your team at a recent dinner. What was their response? Have you seen any creative messages since? I am out of the office for a wedding in HI. My wife and I rented a house for us and our 2 young children. We are essentially just chasing kids around like we do at home, but this time we have a nicer view of the ocean. By stepping away, you empower the people on your team to rise to the occasion and even though their decisions may not be exactly what you would do - and you have to own the decisions when you return - it’s a great opportunity to build trust and develop your team. Plus you get time to recharge your batteries which is so important! You were raising money for the Leukemia & Lymphoma Society, who you’ve been volunteering with since 2014. Can you tell me about your motivation and how this opportunity presented itself? I got involved with this group after a move to North Carolina. I was encouraged by a friend who had been involved in Team in Training in a different state. I was looking for a social network but also was seeking a network that would help keep me healthy. Closer to home, I lost my dad to prostate cancer in 2004 - I was 28. The night before he passed away I went to the hospital. I had a moment alone with him and he was getting really frail - it was obvious the end was near. It was just the two of us, I was sitting on his bed, holding his hand, and I told him I would do anything I could to fight this disease. His said, “I know you will kiddo.” Almost 15 years later, I have raised well into 6 figures for different organizations, ran 6 full marathons, and 16 ½ marathons. Do you and your husband always do these events together? No. My husband has always been an amazing supporter during every marathon, with a sign for me in one hand and a beer in the other. However Kilimanjaro had always been a bucket list item for us. This was his first major go at fundraising and his first time doing an endurance sport. I have always enjoyed running and he loves fly fishing - the mountains are where we can meet, so this was perfect. Beyond the personal accomplishment and money raised, this was a great moment for us to find something that was ours and will be ours forever. Denise (right) and her husband (left) at the summit. What was keeping you up at night in the months before you left? My husband is a cancer survivor himself and was born with a condition that forces him to get surgery about every 13 months - he’s had 30 some odd surgeries in his lifetime. I was so worried about what we would do if one of us couldn’t keep going. I knew that if something happened to him I would lose my mental game quickly and I knew this climb would be more of a mental challenge than a physical one. I also knew that if something happened to me, I’d want him to keep going. We were actually out on a day hike when this conversation came up and we both agreed that we didn’t want to act emotionally in the moment so we decided to make a plan just in case. We came up with a two-tiered program, which I realize sounds so logical as I say it, but we really wanted something logical to turn to if need be! Tier one was that if one of us was struggling to the point of not being able to continue and the guides told us that it was only related to altitude and going back down to lower level would solve the issue, we would separate. We would trust the guides as they had done this trip over 700 times. However, if there was any uncertainty as to what was wrong with either him or I, we would go back together, no questions asked. At any point did you want to give up? If so, what made you keep going? Are you kidding? I’m way too stubborn and competitive with myself. Sure, there were moments where I couldn’t believe I was doing it, but my own story and the stories of the people around me kept me going. The longest day of my life was not summiting Kilimanjaro it was trying to get back to my sister after she called me and said our mom had an aneurysm and passed instantly. I was in my 30s, single, and living in Brussels at the time. After losing both my parents as a young adult, people would say things like, “you’re so strong” and I would just think what other option was there? I had to keep going and pick myself back up. I guess because this climb was something I chose to do, I simply chose to keep going. This wasn’t something happening to me. It was hard, but I chose to keep going. That really raised my confidence and gave strength a new and different face. I realize I can handle more than I thought and also that you don’t have to make big problems out of small things. I had this picture of my mom and dad dancing that I laminated and affixed it to the back of my pack. If you got to a point where you were too tired to carry your bag, one of the guides would actually take it for you. I was one of the only one of us in our group who carried my pack the entire time and it’s because I’d made up my mind that there was no way anyone would carry my parents up there, but me. I have a pretty deep faith and I knew this was the closest I would ever be to heaven with my feet still on the ground. When I got to the top, I balled my eyes out - those tears needed to come. I never doubted that we’d summit. We had the right team, the right gear, and we had prepared. I knew we’d make it. I think it’s safe to say that goes for most things in life, if you’ve got the right people, the right tools and you’ve done the prep work, you can do just about anything. Yeah, you’re absolutely right. Although I have long unpacked from this trip, there's so much mental and emotional unpacking that I am still doing. Let’s keep unpacking then. Was there a moment that really surprised you? I had no idea how close I would get to the 7 guides and the climbing team. There was 65 of us in total. When we left Africa I felt like I was leaving my family behind. I didn’t know how connected I would feel to everyone, especially the guides. They shared themselves, their mountain, their country, their love. Saying goodbye was one of the most difficult parts. There is so much personal satisfaction out of the physical feat, but what I will remember most is everyone’s story - who they were remembering, who they were celebrating. We all were doing that climb for reasons so much bigger than ourselves. This experience really taught me so much and reminded me of that saying, if you want to go fast go alone, but if you want to go far, go together. One person isn’t going to make it alone, but a lot of individuals, when working together, can do a really huge thing. Speaking of, have you had any other major takeaways even in your post-climb reflection? Many things. In looking at our guides, their lives are simple in comparison, but, wow, they are so rich! It made me realize that we get worked up about such silly things. Humans are goldfish - we grow to fit our bowl. After this trip, my husband and I have definitely been thinking about how we can simplify our life, lessen our possessions, be more thoughtful in terms of how we spend our money. Imagine how much more we could do for a greater good if we focused less on material things. On a more professional note, watching the guides taught me a lot about flexing in your leadership - something we talk a lot about in the professional space. The guides would rotate between the front, side, back. They continued to take turns in these different positions over the course of the 8 days. Each day we watched as someone new carried the physical or mental load. Some days the head guide didn’t speak at all, and he would simply pull up the back. I witnessed leadership flexing in real time. Of course I know that a good leader has to be able to adapt based on the situation and who they are working with, but to see it in such a literal sense reminded me how working in teams requires so much flexibility and adaptation. It was such a great analogy to bring back to the leadership in my own organization. Personally, I realized that I am a hell of a lot stronger than I give myself credit for! I knew that I survived a lot and I definitely think of myself as a survivor, but the difference is now I can say it out loud! I am finally owning my strength and my power and it feels so good. I’ve always let others give me compliments on my strength or determination and I’ve sheepishly said, “thank you,” but not anymore. I’m owning it from here on out and I am so excited to see what that means for my team. Yes - own it, Denise! How incredible to come into a new sense of power. I’m curious, now that you’ve climbed one of the highest mountains in the world, what's the next summit on your horizon? I am definitely already feeling the “what’s next” itch. The band of us who climbed together ranging in ages from the 20s to 50s are already planning a reunion hike in one of the U.S. national parks. We had such a strong connection and we don’t want to lose that. But in terms of a big summit, I don’t feel the need to top anything. Certainly, the bar has been raised, but the next real challenge is to use this new-found power! Tomorrow marks a month and half since we summited and I am thinking about how to sustain this sense of accomplishment and continue to own that I am so much stronger than I ever imagined. I am so glad that I did this at this stage in my life, because the combination being 40 and completing this climb really made for something magical. I am realizing it isn’t about what’s bigger it’s about continuing to channel my strength as new things come and using my confidence in new ways, not just for myself but for my team. This is the first time that I feel confident saying I am strong and I feel badass and I don’t plan on stopping anytime soon. Visit Denise’s LinkedIn to learn more about her career at BASF. Cynthia M. Patton is Senior Vice President and Chief Compliance Officer at Amgen, responsible for worldwide compliance and business ethics organization. Cynthia joined Amgen in 2005, and most recently was a Vice President in the Amgen law department with responsibility for commercial legal activities in the United States. Prior to that position, she served as the lead commercial lawyer for both the oncology and inflammation business units. Before joining Amgen, she spent seven years as general counsel of SCAN Health Plan, a California Health Maintenance Organization. Prior to SCAN, Cynthia served as Assistant General Counsel of UniHealth. She began her legal career at Atlanta-based Alston & Bird in 1986 and has worked at Los Angeles law firms specializing in healthcare corporate and securities law. Patton previously served as a board member of Watts Healthcare Corporation. She is a board member of the Eisner Pediatric and Family Medical Center. Patton received her JD from George Washington University and her bachelor’s degree from Vassar College.